Stage plays are broken down in acts. Sporting events are separated into quarters, innings, possessions, drives and plays. Symphonies are composed of movements. Books are split into chapters, while magazines have articles. Similarly, the Mass can be broken down into parts. The Second Vatican Council’s Dogmatic Constitution on the Church (“Lumen Gentium”) reminds the faithful that the eucharistic sacrifice on the altar is the “fount and apex” of the Christian life (No. 11). Therefore, the eucharistic prayer is the moment when that sacrifice is realized. Currently, there are four main options. Eucharistic Prayer I has ancient roots and is traditionally known as the Roman Canon (think: the one with all the saint names). Eucharistic Prayers II-IV are all newer, post-Vatican II developments. Eucharistic Prayer III is often used on saints’ feast days, whereas Eucharistic Prayer II is often used for weekday Masses (think: the one that says dewfall). — Thanksgiving: This is found in the preface, “it is truly right and just, our duty and our salvation, always and everywhere to give you thanks.” The word “Eucharist” comes from the Greek word that means “to give thanks,” thus it’s entirely appropriate that the eucharistic prayer begins with an act of thanksgiving. In other words, it sets the tone for what is about to happen. — Acclamation: The Sanctus, or Holy, Holy, Holy. Through this chant, the Eucharist is never celebrated alone. In the acclamation, all gathered, the visible church, are united with the invisible church, all the angels and saints in heaven. 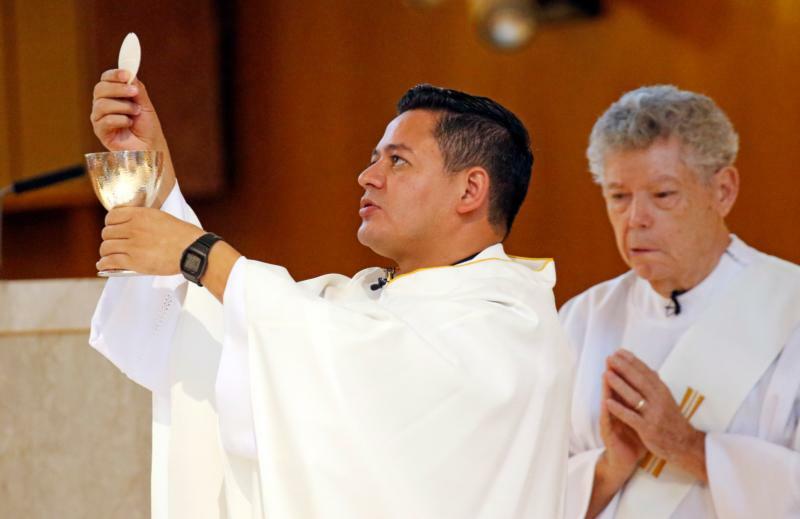 — Institution narrative or consecration: The core of these words do not change in between the eucharistic prayers because they come directly from Christ himself, “Take this, all of you …” This is when the bread and wine become the body and blood of Christ. It is the climax of the eucharistic prayer. The institution narrative ends with the profound line, “Do this in memory of me.” Every time those words are said, that is exactly what is being fulfilled in that moment and then perpetuated on to the future. — Anamnesis: This is the part that can sometimes sound like a reminder of the mysteries of the rosary (think: Passion, Resurrection, Ascension). More profoundly, it’s the church’s way of helping to place the Eucharist within the economy of salvation, within the bigger picture of all the mysteries of Christ’s life. — Oblation, or offering: A chief complaint of young and old alike about the Mass is that they fail “to get anything out of it.” Going to Mass isn’t just about receiving, it is also about giving — offering oneself to God. The Mass is not a “withdrawal-only ATM.” The oblation in the eucharistic prayer helps all to realize this call to a deeper self-gift to God. — Intercessions: Each Mass unites us not only to those present in our particular church, but the entire universal church. In this moment of the eucharistic prayer, this catholicity is realized through pleading intercession for those living and dead. — Final doxology: This brings about the conclusion of the eucharistic prayer by giving glory and praise to God, which is affirmed with the great response, Amen. Father Brooke is a priest of the Diocese of Jefferson City, Missouri. His website is https://frgeoffrey.com and his social media handle is @PadreGeoffrey.